Tuscaloosa National Airport (IATA: TCL, ICAO: KTCL, FAA LID: TCL) is 3.5 miles northwest of Tuscaloosa, in Tuscaloosa County, Alabama. The airport is owned and operated by the City of Tuscaloosa. The FAA's National Plan of Integrated Airport Systems for 2019–2023 categorized the airport as a general aviation facility. The City of Tuscaloosa changed the name of the airport that had formerly operated under the name Tuscaloosa Regional Airport, in March 2019, to reflect the FAA's official designation as a national airport, one of only 89 in the nation. Tuscaloosa National Airport had 2,400 commercial passenger boardings (enplanements) in calendar year 2017. Most of this traffic was athletic charters from the University of Alabama. The Tuscaloosa Industrial Park is next to the airport. 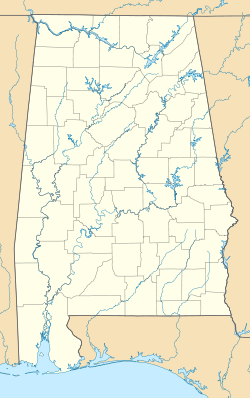 Much of the airport property is bordered by the city limits of Northport, Alabama. In fact, the airport and the neighboring Industrial Park are the only areas included in the Tuscaloosa city limits west of Alabama Highway 69 and north of the Black Warrior River. Tuscaloosa National Airport covers 724 acres (293 ha) at an elevation of 170 feet (52 m). It has two asphalt runways: 4/22 is 6,499 by 150 feet (1,981 x 46 m) and 11/29 is 4,001 by 100 feet (1,220 x 30 m). Runway 4 has an Instrument Landing System and approach lights, allowing landings in visibility as low as a half mile. In 2010 the airport had 55,763 aircraft operations, average 152 per day: 71% general aviation, 27% military, 2% air taxi, and <1% airline. 76 aircraft were then based at the airport: 60% single-engine, 24% multi-engine, 8% jet and 8% helicopter. The airport has two full-service FBOs: Hawthorne Global Aviation Services & Dixie Air Services. In 1939 Oliver Parks was brought to Alabama to set up a Civilian Pilot Training Program, CPTP, for the University of Alabama. A brick hangar was built on the property and the first class of students were licensed before the end of 1939. The airport was opened in April 1940 as Van De Graaff Field. It originally consisted of 4 turf runways: 00/18 (2500 by 500 feet), 04/22 (3777 by 600 feet), 09/27 (4082 by 600 feet), 13/31 (5208 by 600 feet). During World War II, the field was revamped to include a single main runway (the current 11/29). The rest of the field was usable as an all-way field. Pilot training was provided under contact by the Alabama Institute of Aeronautics, Inc. Flying training was performed primarily with Fairchild PT-19s, in addition to PT-17 Stearmans and a few P-40 Warhawks. Beginning in June 1943, Free French Air Force flight cadets began to arrive at the school for Primary flight training, having graduated from the preflight screening school at Craig Field. Military operations were inactivated on September 8, 1944, with the drawdown of AAFTC's pilot training program. Free French training was transferred to the Hawthorne School of Aeronautics, Orangeburg, South Carolina. The airfield was turned over to city control at the end of the war though the War Assets Administration. Runway 11/29 was paved in the early 1950s. A northeast-southwest runway (4/22) was built in 1970, along with a passenger terminal, to facilitate jet service. Airline service to Tuscaloosa began on June 10, 1949, on a 25-seat Douglas DC-3 as one of the original six destinations served by Southern Airways. Southern later served Tuscaloosa with Martin 4-0-4s, and with Douglas DC-9s by 1972. Service would peak in the mid-1970s with four daily departures to Atlanta, Memphis and New Orleans. In 1979 Southern and North Central Airlines merged to form Republic Airlines, which pulled out of Tuscaloosa on June 1, 1984, as most passengers were drawn to nearby Birmingham's airport. Briefly following the exit of Republic, Sunbelt Airlines provided 2 daily flights to Memphis from June 1 through its elimination of service on September 13, 1984. On April 15, 1986 American Eagle began flying between Tuscaloosa and Nashville. The service was initially operated by Air Midwest and operated three times daily from Tuscaloosa on 19 seat Fairchild Swearingen Metroliners. Service ended with the closure of the Nashville hub in June 1996, with service being redirected to Dallas/Fort Worth on 34 seat Saab 340s via Jackson. Due to dwindling ridership, the city voluntarily removed itself from the Essential Air Service program resulting in service being discontinued on April 18, 1997. Atlantic Southeast Airlines flew between Tuscaloosa and Atlanta from 1982 to June 1992. GP Express Airlines would continue service to Atlanta from June 6, 1992, through the elimination of its EAS subsidy on June 30, 1994. No airlines have served Tuscaloosa since the departure of American Eagle in 1997. DayJet announced per seat VLJ service on two pilot planes nonstop to 14 hubs in 3 states in July 2008 from Tuscaloosa. DayJet discontinued all passenger service operations on September 19, 2008 citing the inability to raise financing needed for continued operations. While visiting Tuscaloosa on April 29, 2011, to assess devastation reliefs efforts in the wake of the April 27th tornado disaster, President Barack Obama landed at then-Tuscaloosa Regional Airport in the Boeing C-32 presidential transport plane. The C-32 is the U.S. Air Force designation for the Boeing 757-200 jetliner. Jet charters appear at Tuscaloosa, but scheduled air service has eluded Tuscaloosa National to date. Many charters fly college football, basketball, baseball, softball, gymnastics, and volleyball teams visiting the Alabama Crimson Tide, or take the University of Alabama teams to their away games. Most football charters are operated by Delta Air Lines on Boeing 757's. Many visiting football teams fly into Birmingham and lodge there, commuting to and from Tuscaloosa on game day, since there is not a hotel in Tuscaloosa large enough to house a football team's traveling party. At times, more than one aircraft is used for larger games, with one flying the team and support staff and the other flying university alumni or fans that have paid for a charter. Baseball, basketball, gymnastics, softball, and volleyball charters are typically operated on a Boeing 737's, CRJ200, CRJ700, ERJ 135/145, EMB 120, or Saab 2000. There are also freight charters commonly operated by McDonnell Douglas DC-9s and Boeing 727s to supply the automotive companies which support the Mercedes Benz manufacturing plant. ^ a b c d FAA Airport Master Record for TCL (Form 5010 PDF). Federal Aviation Administration. Effective 30 June 2011. ^ National Plan of Integrated Airport Systems for 2019–2023: Appendix A (PDF, 2.03 MB). Federal Aviation Administration. Updated 1 November 2018. ^ a b Morton, Jason (March 11, 2019). "Tuscaloosa airport gets 'national' name under new classification". The Tuscaloosa News. p. 1A. ^ Passenger Boarding (Enplanement) and All-Cargo Data for U.S. Airports. Federal Aviation Administration. Updated 7 November 2018. ^ Gilbert Guinn. The Arnold Scheme: British Pilots, the American South and the Allies' Daring Plan. ^ a b c Nicholson, Gilbert (April 18, 1997). "1970s saw 8 flights a day from Tuscaloosa". The Tuscaloosa News. p. 4A. ^ Ochoa, Mandy (April 10, 1984). "Leaders urge Republic to reconsider June 1 pullout". The Tuscaloosa News. p. 3. ^ Heine, Max (September 11, 1984). "Airline leaving Tuscaloosa". The Tuscaloosa News. p. 3. ^ a b Reporters, Staff (April 8, 1986). "Airline switching Nashville flights to Dallas hub". The Tuscaloosa News. p. 1. ^ Nicholson, Gilbert (June 14, 1996). "Tuscaloosa-Nashville air link starts April 15". The Tuscaloosa News. p. 5A. ^ a b Nicholson, Gilbert (April 18, 1997). "Last call for boarding...Tuscaloosa loses its airline service today". The Tuscaloosa News. p. 1A. ^ Nicholson, Gilbert (May 6, 1994). "Flights to Atlanta will end". The Tuscaloosa News. p. 1A. ^ Editorial Staff (October 14, 2001). "We need to find some use for municipal airport". The Tuscaloosa News. p. 9A. ^ Morton, Jason (November 24, 2006). "Federal dollars help airport grow". The Tuscaloosa News. New York Times Company. ^ Lee, Suevon (August 15, 2006). "Airport receives $400,000 grant; Money for new airline service, could restore commercial status". The Tuscaloosa News. New York Times Company. This page was last edited on 31 March 2019, at 15:26 (UTC).